The examination of 12th Science Sem 2 was successfully taken by Gujarat Secondary and Higher Secondary Education Board. 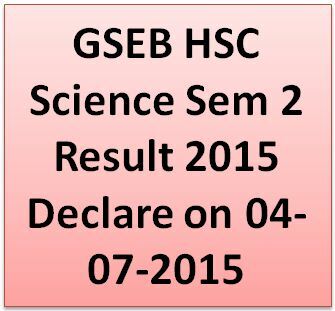 Good news to all the students that GSEB HSC Science Sem 2 Result 2015 has released through its official site gseb.org. We have given below the direct link for result. All candidates are requested to follow mentioned steps to check their results. How to check GSEB HSC Science Sem 2 Result 2015? Enter Your Seat Number and press the GO button. Just a few moment, your result card will be appeared on the screen.